Polish cuisine has been changing dynamically. This is largely due to cooperation between producers and chefs, including French culinary experts. Their cooperation was presented at the Fruit Logistica trade fair in Berlin on 6-8 February 2019. The event is an annual meeting of fruit and vegetable producers from around the world. 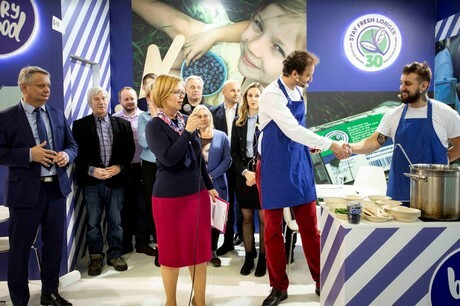 The meeting was organised by the Polish Berry Cooperative, Europe's largest association of blueberry producers. The project was supported by Nicolas Rey, the winner of the Polish edition of MasterChef "The Best" and Michał Czekajło, a finalist of the TopChef show. Growers and chefs show how Polish cuisine is changing. It is still tasty, but getting lighter. In Poland, food is a major tourist attraction, with Kraków selected as the European Capital of Gastronomy Culture. It was the first city in Europe to receive the award from the European Academy of Gastronomy. “Chefs are quick learners, they discover Polish products and often meet their producers. This leads to a breakthrough. Chefs become more aware of the product and the taste, they get a better sense of the technique and processing methods. In this way, they wonderfully slim down the cuisine. Things are getting lighter in Poland. This is the direction Polish cuisine is going” says Nicolas Rey, a culinary expert, the winner of MasterChef "The Best". “For many years, young chefs entering the profession relied only on foreign recipes and products. Time had to pass before they returned to traditional fruits and vegetables. We are really going in the right direction” confirms Michał Czekajło, a chef holding a Gault&Millau toque and a TopChef finalist, the co-founder of Food Think Tank, one of the most original Polish chefs of the younger generation. “A cuisine is what people say it is. That's why we often repeat the stereotypes of Polish cooking being heavy, fatty and dominated by meat. That is changing. You can hear more and more that Polish fruits are delicious and can be used in the kitchen in a variety of ways. Polish cuisine is going in the right direction. It is tasty, but it is also getting lighter”. “As producers, we are taking part in this” says Dorota Zęgota, the President of ELLIOT, which is a member of the Polish Berry Cooperative. Awareness of the healthful role of fruits, including berries, is growing around the world. Global sales of berries are growing at over 6% per year. In the EU, this increase is even higher, at 8% per year. The global sales of berries are already higher than those of apples. Poland is a major producer of fruits and vegetables, and the European leader in their exports. Blueberry is now the Polish fruit with the second highest value of exports. And its popularity is growing. ”Our blueberry lunch, light and very Polish, created a sensation. We served cottage cheese dumplings with blueberries and blueberry jelly. A dish that evokes childhood memories in Poland. Simple, traditional and made lighter by adding blueberry fruit. Our visitors were also presented with blueberry lollipops, intended as a delicious gift for children” said Dominika Kozarzewska, President of the Polskie Jagody Producer Organization (PBC). “Blueberries are Poland’s true showcase product. A Polish export hit. They are produced by people with a passion. Also, Poland has a good climate - the combination of cold nights and very warm days helps obtain a balance of sweetness and acidity. This gives Polish blueberries a unique taste that can be difficult to achieve elsewhere. Many people think these are the most delicious blueberries in the world” added Nicolas Rey, a culinary expert, traveller and a great fan of Poland, born in France. “Blueberries are indeed the absolute highlight of Polish exports. We grow them on acidic soils, working hand in hand with nature. We pick them by hand and, most importantly, we chill them in accordance with our revolutionary 30-minute standard. When chilled so fast, they preserve the taste and qualities of freshly picked fruit for longer” said Mateusz Pilch, co-founder of BerryGroup, member of the PBC.